This book, a timeless spiritual classic, is a moving and fascinating account of how the contemporary spiritual journey unfolds, with all the difficulties those choosing such a path must face, whatever the depth of their faith, its religious context, or their position in the world. 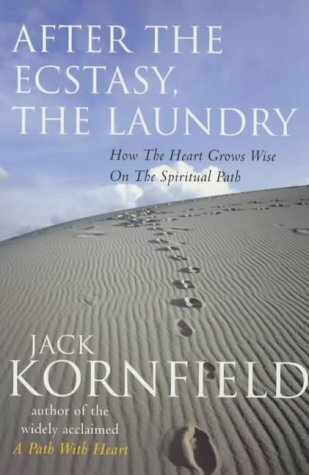 During my own ‘dark night of the soul’ period of 2001-8 I returned to this book several times, never failing to derive comfort, support and strength from what author and Buddhist teacher Jack Kornfield had to say. I continue to feel gratitude for his wisdom. Do read my review, let me know what you think, and give yourself a new year treat of acquiring a copy. And by the way, fellow writers reading this, what a brilliant title, don’t you think?!! In his first best-selling book on meditation “A Path with Heart”, American Buddhist teacher Jack Kornfield describes the powerful impact of his first sight of two massive sixty-foot tall statues of the Buddha and Jesus on a small island of the Mekong Delta. “After the Ecstasy, the Laundry” is its worthy and equally inspiring successor. Kornfield has a deep well of experience to draw from: a Buddhist monk in the late Sixties in Thailand, he has since lived with and taught with monks, mystics, students and teachers from many religious traditions in different parts of the world. He also holds a PhD in clinical psychology and practises as a psychotherapist and meditation teacher. The book is a moving and fascinating account of how the contemporary spiritual journey unfolds, with all the difficulties those choosing such a path must face, whatever the depth of their faith, its religious context, or their position in the world. He accounts for the universality of spiritual longing very simply: “There is a part of each of us that knows eternity as surely as we know our own name. It may be forgotten or covered over, but it is there….there is a pull to wholeness, to being fully alive….as surely as there is a voyage away, there is a journey home”…and (quoting the poet Rumi) “Grapes want to turn to wine”. He makes it clear that there is no separate territory labelled “spiritual” to which the devout may escape; spirituality is doing the dishes and dealing with difficult relatives, as well as moments of winter sunlight illuminating the beauty of a cathedral’s stained glass windows, evoking joy in the presence of the Holy Spirit. Following the spiritual path means making slow peace with the tedious reliability of human imperfection, as we move through the Great Round of living and dying with its inevitable sorrows – and capricious joys. Many quotations, illustrating the profoundly personal and moving facets of a wide range of journeys from diverse traditions including Christianity, reveal the author’s deep respect for all paths to the Source. The case material truly makes this book live, letting us see that however unique our particular route may be, the spiritual journey has core stages common to all seekers of all faiths. In our own strivings, he shows us, we are not alone. It is so heartening and illuminating to read of different seekers’ experiences of the ecstatic: when grace calls forth that sudden falling into radiance, that recognition of indivisibility from Being, or God, or Ultimate Reality, or Emptiness (or the quantum vacuum, if like me you’ve been reading way too many cosmology books of late!). But there is always the return to The Laundry, that inevitable and often painful coming down to the ordinary, sometimes grubby and unsatisfactory basics of everyday life. Importantly, he also points out that for many, ecstasy never comes in a dramatic manner, but as a slow, steady deepening of compassion, wisdom and an increasingly peaceful heart – that which is the eventual fruit of sincere and dedicated spiritual practice. Kornfield writes beautifully, in an honest, open-hearted, humorous and well-earthed way. His book radiates integrity and is obviously rooted in his own long and at times hard struggle to find the spiritual ground of his own being. Just the right degree of personal disclosure makes clear his lack of illusion that being a priest, or a teacher, or a healer of whatever sort, is any kind of vaccination from the pitfalls of the human condition. Jack Kornfield comes across as a reflective, wise and humble man. Let’s hope that the worldwide success of his books has not changed that! “After the Ecstasy, the Laundry” is a timeless treasure, a wonderful companion along the road. This entry was posted in 02 - New Posts: January 2014 onwards, Book Reviews 2014 and tagged After the Ecstasy the Laundry", all paths to the Source, Buddhist Teachers, Emptiness, Jack Kornfield, the poet Rumi, Ultimate Reality. Bookmark the permalink. Now here’s a kick. There’s a post in my files that nearly went up this past season, called “Laundry and Life”. I put it off, in favor of the Grinchy post. I wrote it after seeing a series of photos of clotheslines by a photographer friend, and will be using at least one of his pics in the post. I’ve always contended that, while retreats, conferences, and such are valuable, there’s equal – or even more – value in attending to the events of daily life. There’s a reason the parables of Jesus are so memorable. It’s not just that they’re simple, short, and easy to pass on. It’s that they capture truth in ways that even sophisticated and educated people can catch a glimpse! development, usually ones you’d rather not have! I came across a book printed in 1945, the title is “The Open Door” by Theon Wright…..and the quote from page 127 which says: “Those who have achieved wisdom can point the way, but they can only open the door; they cannot push others through it. Quite amazing isn`t it ? Thank you again Anne. I`m fond of you. P.S. Happy New Year by-the-way. Happy New Year to you too, Inger LIse. And thank you for your thoughtful comment.